Representing one of the oldest languages in the world, Tamilians belong to the prestigious Dravidian line, and take much pride in protecting their tradition and culture. 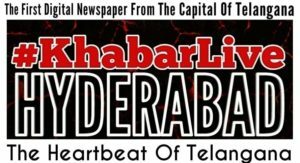 #KhabarLive talks to a few Tamilians of Hyderabad who made Hyderabad their home. Carnatic music kutcheries, pongal, Kanjeevaram silk saris and an appreciation for filter coffee are the gifts of the Tamilians to the rest of the population. The thrifty community of English language aficionados is known for its educational qualifications and love for all things musical. Tamilians have been residing in Hyderabad for more than a century now. There are about 4.5 lakh Tamilians here who are scattered across different professions. 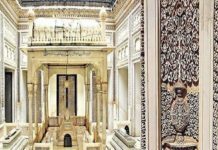 It is said that around 150-200 years ago, some influential families came to Hyderabad to work with the Residency and the Nizam. Kandaswami who was known as the ‘vakeel’ served as a bridge between the Residency and the Nizam. Since the Nizam knew only Persian and Urdu languages and those from the Residency spoke only English, the vakeel worked as a translator between the two. He was respected by the Nizam and was awarded acres of land for his service. The Kandaswami lane in the Old city is named after him. Broadly, Tamilians can be divided into various sects like Iyer, Iyengars, Mudaliars etc. Iyers are Hindu Brahmins who are followers of the Advaita philosophy propounded by Adi Shankaracharya. The Iyers believe in the supremacy of Lord Shiva, and the Iyengars believe in Lord Vishnu and follow Ramanuja’s teachings. The Mudaliars keep faith in all the Gods. They come from a trade, business and agricultural background. From the beginning, Mudaliars have played a very important role in the history of the city. With many establishments still used by the public to their credit, some of their actions especially had a long-term impact on the women of the city. The prestigious Keyes High School for Girls, which is a major landmark in Secunderabad, was the first school in Hyderabad set up exclusively for girls in 1881. It was started out of a single room as ‘Girls Patashala’ by A Venu Gopal Pillai, while Dewan Bahadur Padma Rao Mudaliar who was a powerful personality from the Tamilian community, converted the Patashala into a middle school later on. During the pre-Independence era, parents strictly followed the purdah system for their daughters. Girls were expected to remain within the confines of the home and learn to manage it. Rather than educating them, the focus was on the marriage of the daughters at an early age. ALSO READ: Few Interesting Facts About 'Hyderabadis' Which Makes Them Proud Among 'Indians'! Keeping all this in mind, the then management came up with the idea of bringing girl students to school in bullock carts sent to their houses. “Dewan Bahadur Padma Rao Mudaliar would visit houses and convince parents about the importance of education for girls,” recalls Revathy Thangavelu who is the honorary secretary of the school. Spread over six-and-a-half acres of land, Keyes High School servers as a venue to many cultural activities in the city every year. Piety is inherent in most Tamilians; in fact, the stereotype of a man clad in a dhoti with vibhooti lines on his forehead as he talked in rapid Tamil arose from here. The appearance was so distinctive that even now, all South Indians tend to be pegged Tamilians by those from the North. The Secunderabad area has a large population of Tamilians, especially Padmarao Nagar, Sainikpuri, Malkajgiri, Safilguda, etc. Iyers populate the area of Padmarao Nagar which is also home to a Skandagiri temple. “There were a group of ardent followers of Lord Subrahmanya Swamy, who all got together way back in 1961 and formed a committee. My father Rajamani, a devotee of Lord Subrahmanya, who was also the founder-member, volunteered on making the moolavigrahas, Sundara Vinayaka Murthy, as his personal contribution and placed an order with a stapathy (sculptor) at Chidambaram in 1965. However, when Sri Chandrasekharendra Saraswathi Maha Swamigal visited Hyderabad, he chose this hillock with greenery as Lord Subrahmnaya is known to stay on a hillock. 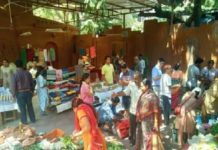 Since then, the temple sees lots of devotees who come to worship here,” says Krishnan Rajamani, managing trustee of the temple. The Iyengars perform the Tiruppavai during the Dhanurmasam. Tiruppavai is a collection of 30 stanzas (paasurams) written in Tamil by Andal, in praise of Lord Vishnu and is an important part of Tamil literature. “It is said that Goda Devi/Andal incarnated on the Earth in the 98th year after the beginning of the Kali Era. She took a wonderful vow called Dhanurmasa vratham to tell us that, by practising this vratham, one can attain all materialistic happiness along with eternal bliss,” says Radha Iyengar, who regularly chants Tiruppavai during Dhanurmasam and is a follower of Jeeyar Swamiji. BOX: The period, from when the sun moves into the constellation of Dhanur-raasi or Sagittarius, and until it moves out to the constellation of Makara-raasi or Capricorn is known as Dhanurmasam. Tamilians also celebrate almost every festival like Dasara, Ugadi, Ganesh Chathurthi, and, most importantly, Diwali and Pongal. “We celebrate Naraka Chaturdasi, when the demon Narakasura was killed by Lord Krishna and Satyabhama. The day is celebrated with early morning rituals like taking head bath and burning the crackers and festivities. This comes a day ahead of Diwali,” says Hymavathy Srinivasan, retired officer from Syndicate bank and also a member of Sharada Cultural Trust. Hymavathy usually wears a nine-yard sari during festivals. “On the day of Diwali, we eat Deepavali Lehiyam, a medicine that tastes like chyvanprash eaten on an empty stomach. It aids in digesting all those special delicacies cooked by women,” says K Srinivasan, a retired scientist from Telangana Pollution control who considers his wife’s cooking to be incomparable, with a smile. As attires go, Tamil women wear typical jewellery that has come to be synonymous with them. Instead of a gold mangalsutra, they wear a thread smeared with turmeric. “Before getting married, it’s common for a girl to pierce her nose on the left side. After marriage, they do it on the right side. But, this tradition isn’t followed much these days,” says Uma Sugavanam, who also has an interest in art and artistry. Coconut is a mainstay of cooking in Tamilian households. Light with their spices, their food requires ample use of vegetables. Their staple diet includes dishes like Sambar, Rasam, Avial, Morkolambu, Vatha Kulambu, Kootu, and Tohail. Non-vegetarian households have a good mix of fish, chicken, turtles and mutton. At certain traditional homes, meals are eaten on banana leaves even today. Breakfast combinations like idly-sambar, vada-pongal were introduced by the Tamilians to the rest of the country. While it is usual to imbibe local delicacies into one’s palate, Tamilians, in turn, all over the world, have introduced many varieties of food to the world. Muthu Hari, who hails from Dharmapuri district, Tamil Nadu, has been settled in Hyderabad since 2005. He established his own bakery known as SVB Iyengar’s, in Sikh village. “I have worked in patisseries since I was a kid. At my bakery, I have customers who have been coming for years and employees who are all Tamilians,” says Hari, who is about to start a new branch on MG Road after Diwali. Carnatic music has been synonymous with Tamilians for time immemorial. The love for culture also permeates into Bharatanatyam. It’s difficult to find a single home where people don’t have a propensity for music (or dance). Tamilians have a penchant for singing or dancing. With much talent in the community waiting to be tapped, a group of cultural enthusiasts started the famous cultural trust Kalasagaram in the city in 1967. Artistes consider it a milestone if they get a chance to perform for this organisation. “We have been committed to promoting cultural activities for over five decades now. Kalasagaram has steadily grown in its stature and has successfully completed 50 years of service to the cause of Fine Arts in the realm of music, dance and drama. We have established ourselves as a premier cultural organisation in the country. After an initial search for a venue, we decided on the Keyes High School premises as it has ample parking and space,” says, Rajagopal, one of the founder-members and general secretary of Kalasagaram. The twin cities have many Tamil organisations – the Mudaliar Sangham, Tamil Sangham, Chettiyar Sangham, etc. Tamil women are socially very active; in fact, the elderly women of the twin cities have all come together and formed a trust called Sharada Cultural Trust, which was initially started as a bhajan group in West Marredpally. The current president Ambuja Ramakrishnan and secretary Sharada Krishnan and the committee members are the main pillars of the cultural activities happening in the city. It is said that, during ancient times, people used to judge the talent of the women by their rangoli (kolam). It is drawn before the sunrise and is said to welcome Goddess Lakshmi. The Tamilians have a special style of drawing the rangoli with rice flour, as they believe even the tiniest creature on the planet should be fed. They apply a special red colour to the borders of the rangoli to make it look attractive. Dewan Bahadur was a title of honour awarded during the British Raj. It was awarded to individuals who had performed great service to the nation. Mahoob Boys School was established in 1862 by Somasundaram Mudaliar, with the name – Anglo Vernacular School. Keyes High School for Girls was the first school in Hyderabad set up exclusively for girls in 1881.